Our Volkswagen California First takes travelling comfort and wellbeing to the highest level with a range of well-designed, carefully selected finishes and equipment. To define our California First's quality standards, we started with high-end Volkswagen models such as the California Ocean, California Edition and California Coast, then outfitted them with a special pack of options. When you hire a Volkswagen California First from WeVan, you get a vehicle equipped with the (famous) automatic DSG7 gearbox and powerful 150 PS to 204 PS engines so you can take worry-free trips all around Europe, from mountaintops to seashores! When you add 4Motion transmission (upon request, depends on model), this already sporty campervan becomes a unique vehicle in the industry. And since the appearance, aesthetics and additional functionality match its high technical specifications, the California First's interior and exterior trim levels are top-notch and include 18" rims, LED lights, fog lamps, interior ambient lighting and more. Our Volkswagen California First vehicles are equipped with high-quality equipment and functional accessories. In addition to the comfortable mattress and additional Brandrup© storage pockets, we have added many other options to give you an extraordinary experience, including a 12V espresso maker (compatible with Nespresso© pods), a Dyson© hand vacuum and a set of towels for two. Of course, the California First has all the standard California features in terms of layout, comfort and independence. Its compact size (height < 2m) allows you to park almost anywhere and easily find a dream spot to set up your camp for the night. The Volkswagen California's sleeping area has two comfortable double beds: the first one is in the lounge area (114 x 200cm) and the second is “upstairs” under the electrically operated pop-up roof (120 x 200cm). Each of the beds has their own night lights and 12V sockets nearby. Built-in blinds allow you to completely block out the exterior world. You will feel as comfortable as if you were at home…except that your home probably isn't on a lakeshore or deep within a forest! Once the roof is up, just push the upper bed's base up too and you will be able to stand up in the lounge – the perfect way to expand your living space! You will have no problem setting the table and using the stove to prepare scrambled eggs for breakfast. 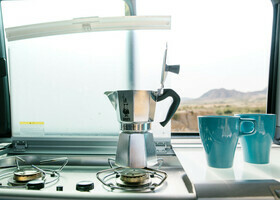 Finding good local products and preparing them in your van is a key activity on a van adventure worthy of the name. The Volkswagen California First's kitchen includes a two-hob cooktop, a 42-litre compressor fridge, a stainless steel sink connected to two 30-litre containers: one for drinking water and one for greywater, a worktop, and cabinets for storing the kitchen equipment provided. Driver and passenger seats swivel to face the rear bench, allowing you to enjoy good times around your indoor table while sampling the dishes cooked “on the road”. The California First's energy independence is another benefit. It has three batteries to run the campervan's equipment (like the precious auxiliary heating) and the many interior 12V or 230V sockets. An isolator saves the engine battery so you can always start the van. The auxiliary batteries recharge while you're driving. You can also plug into the mains using the van's exterior 230V socket. To help you prepare for your trip in your rental Volkswagen California First, we encourage you to read through our Preparing for Your Campervan Trip guide, which features additional information on WeVan equipment, accessories and services, as well as tips and a list of other reference materials.